This morning, people in Eastern Ontario woke up to find that freezing rain had fallen during the night. Everything was coated with ice, like this tree branch. The icy roads were really dangerous but a lot of salt had been spread on them, so they were just slushy when I took this photo. 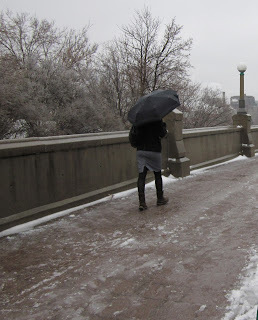 The freezing rain continued to fall as I walked to work. People hid under their umbrellas and walked very carefully because the sidewalks were like skating rinks and quite treacherous. 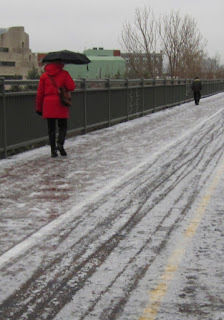 Amazingly enough, some people continued to ride bicycles despite the weather and you can see the bicycle tracks on the ice in this photo. I managed to keep from slipping by finding patches of snow to walk on and railings to hang on to. Freezing rain is really nasty stuff - let's hope we don't have any more this winter. Ugh, those sidewalks look SO dangerous!! I hate freezing rain. I can't imagine riding a bike in it. Amazingly, we dodged that bullet. We had an inch or so of snow, and then rain. When everything froze up again, we had crunchy snow.